Equatorial Guinea is one of the African continent's least visited countries. It has a reputation for political instability with a history full of coups and corruption; and although vast offshore oil reserves generate huge wealth, the majority of Equatoguineans live well below the poverty line. However, for those in search of a totally different vacation experience, Equatorial Guinea offers plenty of hidden treasures. Pristine beaches and dense forests filled with endangered primates are just part of the country's considerable charm. Despite its name, Equatorial Guinea is not on the equator. Instead, it is located on the coast of Central Africa, and shares borders with Gabon to the south and east, and Cameroon to the north. Equatorial Guinea is a small country with a total area of 10,830 square miles/ 28,051 square kilometers. This area includes a slice of continental Africa, and five offshore islands. Relatively speaking, Equatorial Guinea is slightly smaller than Belgium. The capital of Equatorial Guinea is Malabo, a laidback city located on the offshore island of Bioko. According to the CIA World Factbook, July 2016 estimates put Equatorial Guinea's population at 759,451. Fang is the largest of the nation's ethnic groups, accounting for 85% of the population. 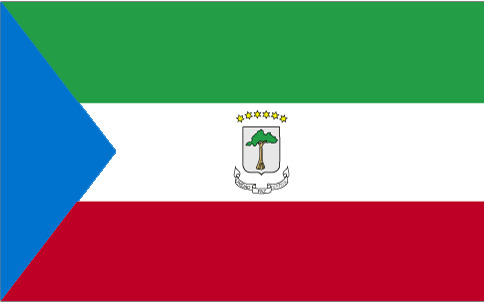 Equatorial Guinea is the only Spanish-speaking country in Africa. The official languages are Spanish and French, while commonly spoken indigenous languages include Fang and Bubi. Christianity is widely practiced throughout Equatorial Guinea, with Roman Catholicism being the most popular denomination. Equatorial Guinea's currency is the Central African franc. For the most accurate exchange rates, use this currency conversion website. Like most countries located near the equator, temperatures in Equatorial Guinea remain constant throughout the year and are dictated by elevation rather than season. The climate is hot and humid, with plenty of rainfall and lots of cloud cover. There are distinct rainy and dry seasons, although the timings of these depend on where you're going. Generally, the mainland is dry from June to August and wet from December to February, while the seasons on the islands are reversed. The best time to travel is during the dry season, when the beaches are most pleasant, dirt roads are in the best condition and forest treks are at their easiest. The dry season also sees fewer mosquitoes, which in turn reduces the likelihood of mosquito-borne diseases like Malaria and Yellow Fever. Equatorial Guinea's island capital is primarily an oil town, and the surrounding waters are littered with rigs and refineries. However, a wealth of Spanish and British architecture provides a picturesque insight into the country's colonial past, while street markets burst with local color. The country's tallest mountain, Pico Basilé, is within easy reach, while Bioko Island boasts some beautiful beaches. Covering 540 square miles/ 1,400 square kilometers, Monte Alén National Park is a veritable wildlife treasure trove. Here, you can explore forest trails and go in search of elusive animals including chimpanzees, forest elephants and the critically endangered mountain gorilla. Bird species are prolific here, and you can even arrange to stay overnight in one of the park's forest campsites. Located 30 miles/ 50 kilometres south of Malabo on Bioko Island, Ureka village is home to two beautiful beaches - Moraka and Moaba. During the dry season, these beaches offer the opportunity to watch as sea turtles emerge from the ocean to lay their eggs. The surrounding area is also home to pristine jungle and the beautiful waterfalls of the Eoli River. Remote Corisco Island is situated to the south of the country near the border with Gabon. It is the archetypal paradise island, with deserted white sand beaches and shimmering aquamarine waters. Snorkelling and scuba diving are both excellent here, while the island's ancient cemetery dates back some 2,000 years and is thought to be one of the oldest in Central Africa. Most visitors fly into Malabo International Airport (SSG), which is also known as Saint Isabel Airport. The airport is located approximately 2 miles/ 3 kilometres from the capital, and is serviced by international airlines including Iberia, Ethiopian Airlines, Lufthansa and Air France. Nationals of every country except the U.S. require a visa to enter Equatorial Guinea, which must be obtained in advance from your nearest embassy or consulate. Visitors from the U.S. can stay for up to 30 days without a visa. If you are from or have recently spent time in a Yellow Fever country, you will need to provide proof of Yellow Fever vaccination before being allowed to enter Equatorial Guinea. Yellow Fever is endemic within the country, too, so vaccination is recommended for all travellers. Other recommended vaccines include Typhoid and Hepatitis A, while anti-malaria prophylactics are also strongly advised. See this website for a full list of recommended vaccines. This article was updated and re-written in part by Jessica Macdonald on December 1st 2016.